An amanuensis is a person employed to write what another dictates or to copy what has been written by another. 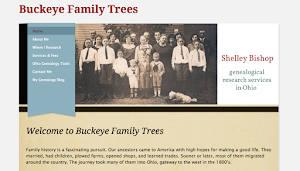 Amanuensis Monday is a genealogy blogging theme popular for the transcription of family letters and documents. 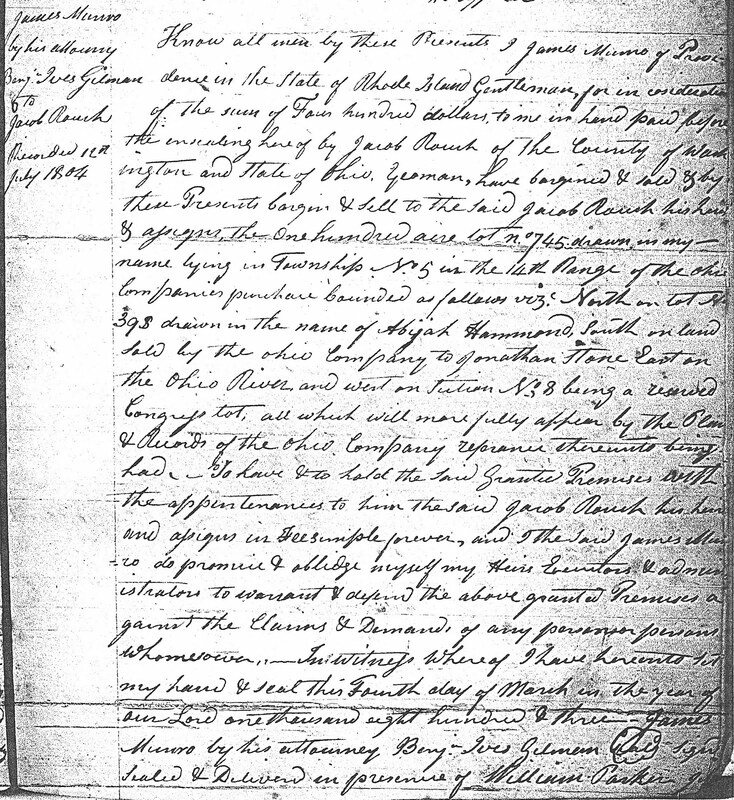 My sixth-great-grandfather, Jacob Roush, bought this parcel of land on March 4, 1803—just three days after the Ohio General Assembly met for the first time in Chillicothe to officially declare Ohio’s statehood. The deed indicates that Jacob was already a resident of Washington County, but I have yet to determine exactly where he was living prior to this purchase. I do know that his daughter, Catharine Roush, was married to Peter Lallance in Marietta (the county seat) in January 1799. Washington was the parent county out of which Gallia County was formed. William Parker Junr[,] Joseph Gilman___ Washington County State of Ohio, Marietta 4th March 1803, Benjamin Ives Gilman personally appearing acknowledged the foregoing Instrument by him subscribed as agent for James Munro, to be his Voluntary act & Deed, before Joseph Gilman one of the Judges of Territory of the United States north west of the River Ohio. 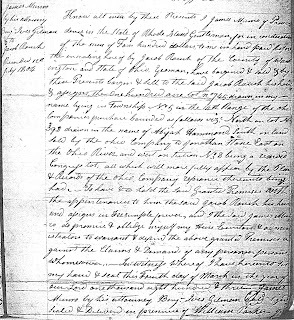 Citation: Gallia County, Ohio, Deed Book 1: 69-70, James Munro to Jacob Roush, recorded 12 July 1804, Recorder’s Office, Gallipolis; Family History Library microfilm 317,675. Can you "fly" there with Google and see what it looks like today? Margel, I intend to try doing just that later in the week! Got my fingers crossed. Thanks for reading! Thanks for this, Shelley. Jacob was my GGGG grandfather. So glad that you found this, Rebecca, and left a comment for me. It's great to meet a new cousin, no matter how distant we might be! 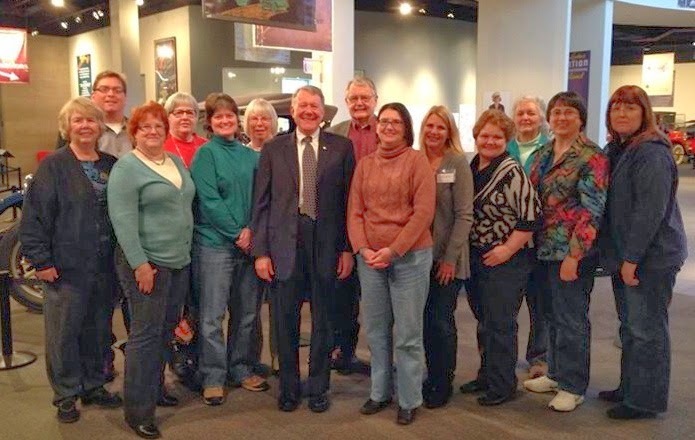 Are you planning on going to any of the Roush reunions? Please feel free to email me and keep in touch.